MerryCopa debuted last year as the city of Maricopa’s holiday celebration. The event returns to Copper Sky Regional Park on Dec. 5 with expanded hours. Having the Christmas celebration from 2 to 8 p.m. will give people “more time to enjoy the activities,” Special Events Manager Niesha Whitman said. Last year, events ran from 3 to 7 p.m. Admission to MerryCopa is free. Mayor Christian Price will lead the countdown to unveiling the Christmas tree by the lake. There will also be pictures with Santa and local entertainment. The city has tweaked and added events for MerryCopa. New this year is the Gingerbread House Decorating Contest. Contestants will make their gingerbread houses at home and bring them to be judged at Copper Sky. Deadline for registration is Dec. 2. Contest categories are Individual Children 10-under and 11-17; Children Groups 10-under and 11-17; Adults 18+ individuals and professional/business. Entry is free. Email Karie Karpes at karie.karpes@maricopa-az.gov for rules and registration information. Winners of the Gingerbread House Decorating Contest will be announced at 6 p.m. The grand prize is a $100 gift card and a holiday ham from Fry’s Marketplace. Cookie decorating is back but will be moved into the Large Ramada, Whitman said. Cookie decorating is $1 and so is hot chocolate. For movie-lovers, The Grinch will be on the big screen. The Snow Zone includes a snow slide, ice rink and bounce houses. “The ice rink is a little bit bigger than the one we had last year … so people will be happy about that,” Whitman said. 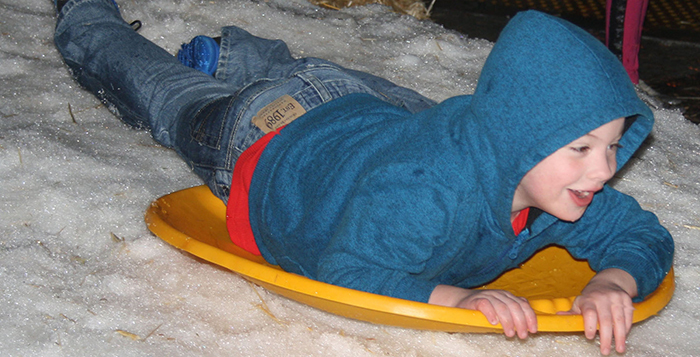 The snow slide will be the same size for children who want to take a spin on a saucer. 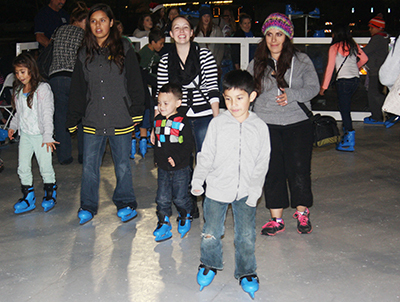 A wristband to enter the Snow Zone for ages 3 and up is $5. There will also be a “passport” card participants can take to 10 vendor booths for a prize. Going to all vendor booths can earn a seven-day pass to Copper Sky. Whitman said the city is still looking for arts and crafts vendors. This story was published in the December issue of InMaricopa News.